Gratis online conversieprogramma van PDF naar DWG converteert PDF-data in bewerkbare AutoCad DWG-eenheden: lijnen, polylijnen, arceerlijnen, bogen, ellipsen en afbeeldingen. Conversie van de lagen van een PDF-bestand. Optie PDF-lagen naar DWG-lagen. DWG-bestanden na conversie bewerkbaar. Veranderingen: The Import PDF/EMF command imports PDF, EMF and WMF files in vector format; Export into 3D file formats: STL, OBJ, OBJF, NMF, LMTS; Embedding of Xref files into the current drawing; Page to CAD command converts the active layout of the loaded file into the DWG/DXF vector format. 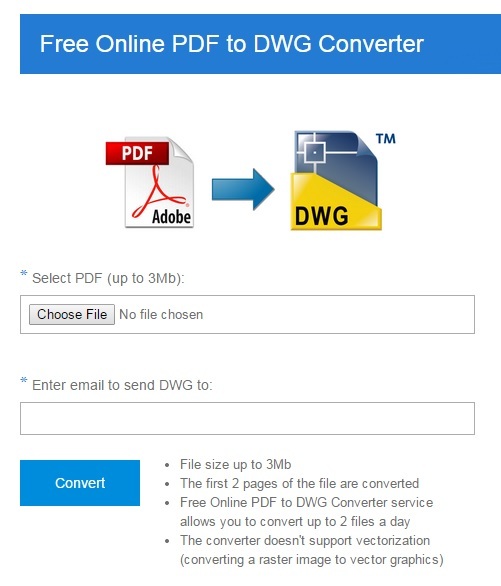 PDF to DWG Converter is a free online service created for converting PDF files into DWG. The main advantages of this converter are the accuracy and the high speed of conversion. Conversion service allows converting up to 2 files a day. The free online service PDF to DWG of CADSoftTools can be freely distributed over the internet in an unchanged form.